Register and Activate Jio Prime Membership to continue the current Happy New Year Offer. There is now many ways that you can subscribe Prime for 1 Year. Currently, There are only 3 ways that you can sign up for Jio Prime. Above Plans are only for the Prime Members who activated it for Rs. 99. Still, this is very beneficial for everyone because the other companies will give just 500 MB 4G data for more than Rs. 149. If you don't want to activate prime then you'll get charged for using the internet and if you activate any plan without Prime membership then it'll very costly to you. See the other plans for the Jio non-prime users. As Above plans, the data benefit will be cut down and the validity too. This Non-Prime Plans will beneficial for who didn't have to work on the Internet but who had to work daily and connected to the internet all the day then We are suggesting you activate the Jio prime as soon as possible. This benefit is limited time only because the last date of activation of jio prime is 31st March. Otherwise, You will get to activate the regular plans of Jio. When we compare the both plans; Jio Prime and Non-Prime we've seen a huge change in internet data benefits. suppose, When you give Rs 99 to activate jio Prime you'll get extra benefits. For Example; For Jio Prime Users, they will get 28 GB data for 28 Days and in other hands, for the jio non-prime users, they will get only 2.5 GB for 30 Days. Prime Membership Charge is Rs. 99 + Data Plan Rs. 303 = first month charge Rs. 402. So, it'll be charged only Rs. 402 for 28 GB of Data pack with the validity of 28 days. You will get more data in all Jio 4G Plans. You will continue having Jio Happy New Year Offer after activating Jio Prime. In Rs.303 you will get 1 GB Data daily for 30 days, non-prime users will Get only 2.5 GB Data for 30 days. 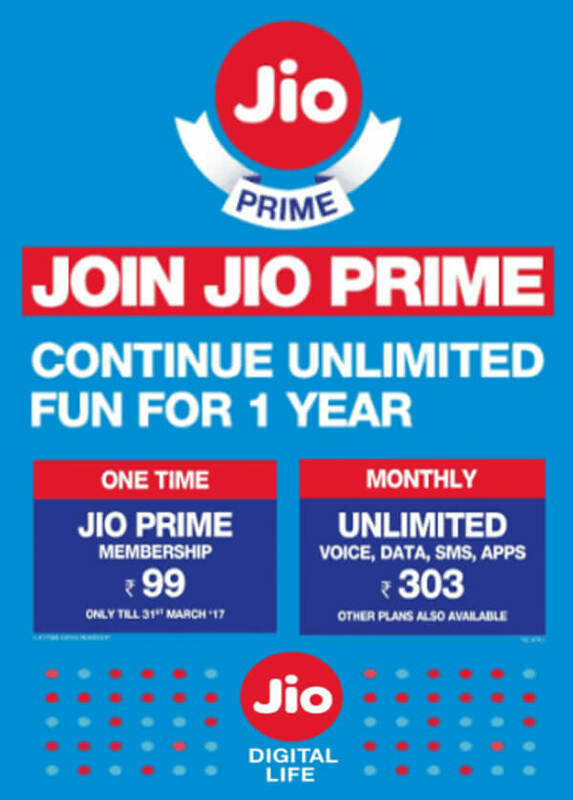 Enjoy Happy New Year Offer and Jio Prime Membership benefits Till 31st March 2018. The Last Date to Activate Jio prime is 31st March 2017. We don't know Jio can extend the last date for subscribing Jio Prime membership. Please do not download and install any third party or unofficial apps from the Internet because they will harm your privacy can fetch many important details from your smartphone. So, please be aware of those malicious apps. To know which apps are genuine or official then you can visit their official website Jio.com.